Working Scaffolds are temporary constructions. They serve to create higher-positioned working areas for construction site activities, on buildings as well as on industrial facilities. In addition, they ensure that working areas can be safely accessed. 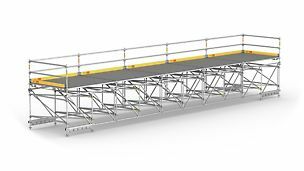 Modular scaffolding systems guarantee fast erection times, high load-bearing capacities and safety levels for assembly and dismantling as well as during use. 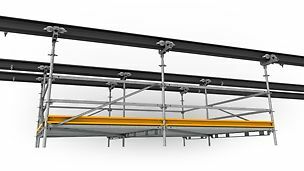 While frame scaffolding is aimed at ensuring a high tempo for 3D scaffolding construction, modular scaffolding with nodal points for connecting ledgers, brackets and other components provides greater flexibility for geometrical adjustments. In the process, country-specific occupational health and safety legislation and standards regulate the requirements placed on a scaffold with respect to assembly, bracing, anchoring and sufficient load-bearing capacity for the various areas of application. 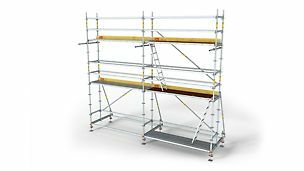 Scaffolding is also named after its area of application. For work operations on the front of a building, narrow facade scaffolding is used. On construction sites, working platforms are normally utilized as well as reinforcement scaffold. 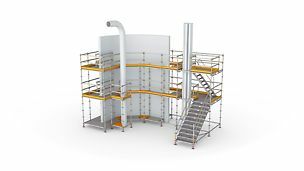 Industrial scaffolding is the name given for providing access and work platforms on industrial installations.